Maritime transport accounts for 80% of world transport. Unlike all other transport sectors, emissions from maritime shipping are entirely excluded from international climate treaties, although they are projected to rise by 50-300% by 2050 (IMO 2014). Nonetheless, there is an enormous potential to reduce maritime emissions, which has yet to be exploited. Compared to the baseline scenario, combined technical and operational measures could reduce GHG emissions by 60-75% per ton-kilometer (t-km) by 2050 (Sims et al. 2014, European Commission 2013). Yet, to date, these technical measures have not been pursued because implicit tax subsidies for maritime fuels considerably weaken incentives to reduce emissions, such that ships today are even less efficient than 25 years ago. Among academics and policymakers it is generally agreed that these implicit tax subsidies for fuels combusted in maritime transport—which are currently granted around the world—are inefficient, but that their abolishment requires a unanimous international agreement. Such an agreement is deemed indispensable because any unilateral action would be impossible due to massive tax competition in this industry, competitiveness effects and the legal limits to regulating an industry operating mostly in international waters, i.e., outside the jurisdiction of any given state. However, an international agreement to solve these problems has proven impossible to reach, thus perpetuating the inefficient status quo. 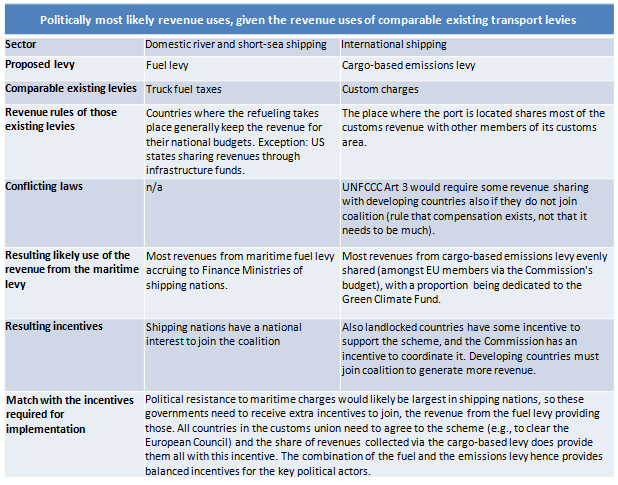 To break this deadlock, we propose a scheme whereby a small coalition of countries, to start with, can abolish these implicit tax subsidies even in the absence of an international agreement: the mechanism combines charging a levy on emissions from international maritime shipping with a fuel levy on fuel consumption by domestic shipping. The levy on emissions would be charged by customs authorities from cargo consignees and consignors per t-km of cargo transported and calculated based on the fuel efficiency. GHG emissions from international shipments, i.e., shipments to and from the countries that introduce the scheme, would be subject to an emissions levy. The definition of the levy base is one of the two main economic innovations in our proposal. In the absence of an international agreement, the internalization of international maritime emissions is not feasible through fuel taxes. However, it is feasible if the levy is based on cargo, instead of fuel, since the elasticity of demand for cargo discharging is much lower than that for maritime fuels. Ships could hence be charged for the emissions released in transporting cargo to and from a given port. Applying the scheme to the EU would cover ~20% and to the US and Canada ~12% of global emissions (Faber et al. 2009). Under this scheme, ships would not divert to another port to avoid the levy as long as all ports in the immediate vicinity charge the same levy. As sea transport is significantly cheaper than any other mode of transport, a levy of the size that we propose would not be avoided profitably by choosing a port further away from the destination market. Competition between ports for the same cargo does exist, but it is restricted to rather small regions. 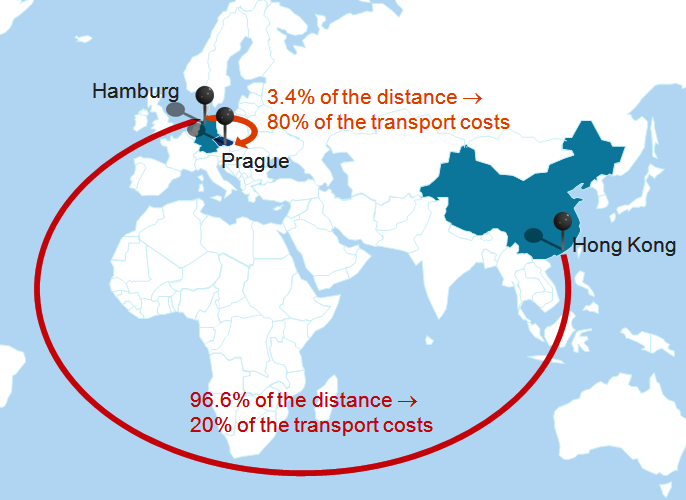 Example of relative costs of alternative transport modes for a shipment from Hong Kong to Prague. Source: Authors' compilation according to Federal Office for Goods Transport (2005, p. 3). For transit and transshipment, however, the price elasticity of demand for cargo discharging is too high for efficient charging. I.e., in these special cases port choice is a lot more flexible. The levy would therefore only be applied at the final destination of cargo, which also prevents double charging. In order to provide dynamic mitigation incentives, the levy needs to vary as closely as possible with actual emissions. Ship emissions vary, however, due to many different factors which are hard to observe, like a ship’s speed, its fuel efficiency, the fuel type, any application of emissions capture technology (for non-CO2 GHGs), its capacity usage, and the detours from direct shipping routes that come with transshipment. Under previous proposals, the need to obtain all this data was addressed by mandating ships to reveal it. Legally, however, the acting state does not have jurisdiction for mandating such disclosure of data, apart from the ships that enter the state’s port. This would impede the efficiency of the levy. Notice that only half of the incurred climate damage is considered. This is due to the assumption that the coalition of countries that impose the levy only has a legitimate claim on half of the emissions, while the country of origin (for imports) or the country of destination (for exports) has the right to claim the other half. In this way no multiple carbon pricing would occur even if other jurisdictions introduced a similar carbon pricing scheme. In the EU, the calculation of the default values would be the simplest. Combining data that is available in the EU's databases “Measurement, Reporting and Verification” and “Electronic Manifest System” provides annual estimates of the CO2-emissions per t-km for each ship that calls at EU ports. For those ships, the default value can therefore be based on each ship’s own past emissions, thereby closely approximating current emissions. For ships outside the EU, the default value can be based on IMO energy efficiency classification systems and the AIS ship positioning system, which indicates speed and detours. All these systems are highly automatable and would therefore allow for determining default emission values at a relatively low cost. This subsidy provides the authorities with a learning mechanism to improve the calculation of default values, and it provides efficient shippers with a dynamic incentive to further improve. Inefficient shipping companies receive indirectly incentives to improve, due to the higher net levy incidence that they bear and due to the competitive pressure of their cleaner competitors receiving a subsidy that they do not receive. Emissions from domestic river- and short-sea shipping can be charged through a fuel levy, because there are fewer avoidance opportunities than is the case for international shipping. This fuel levy also provides dynamic incentives for emission reduction. A fuel levy entails lower administration and compliance costs than a cargo-based emission levy. The fuel levy is paid by the ship owner and collected by the refueling company. The levy's rate would be based on the same carbon price as the emission levy on international shipping emissions. Through a rebate mechanism that applies in the (few) cases where double charging is possible, the two systems can coexist without creating distortions. The second innovation of our proposal relates to the limits of the acting state’s jurisdiction. It is generally believed that the internalization of maritime emissions is severely limited by existing legal frameworks. Countries do not have jurisdiction for charging ships outside their territorial boundaries. Previous proposals have solved this legal problem by massively reducing the scope of the measure. It has been argued that the acting state only has the necessary jurisdiction to charge for a ship’s emissions when a ship enters its ports (Faber et al 2009, Kågeson 2011, Hemmings 2011, Kollamthodi et al 2013). While this approach is lawful, it entails great economic and environmental disadvantages. Charging just the ship that enters into the acting state’s port exempts all the emissions that were released before any transshipment of cargo. Accordingly, the size and location of transshipment markets gets distorted, which raises overall economic cost and carbon leakage. In our scheme for international shipping, the levy is applied to all emissions caused in transporting a piece of cargo from its port of origin to its destination port, whether or not transshipment has taken place in upstream ports. To make this greater coverage possible, the charging state receives its jurisdiction through a different channel: The legal liability falls not on the ship, but on the domestic cargo consignee (for the emissions released in the incoming transport of their cargo) and the domestic cargo consignor (for the emissions released in the outgoing transport of their cargo). Consignees and consignors are domestic entities and therefore chargeable without extraterritoriality restrictions. While this method of attributing the legal liability to pay the levy solves the extraterritoriality problem without sacrificing scope, it does not impose a greater economic levy on domestic entities, compared to other proposals. This is due to the independence of the economic levy from the attribution of legal liability. Whether shipping companies or their transaction partners are charged does not change who bears the levy, but it does make all the difference in whether the levy would be lawful or not. Legally, the restriction to not charge international shipping for its emissions applies in public law, where a state is bound by the prohibition of extraterritorial taxation contained in the United Nations Convention on the Law of the Sea. Private contract law knows no such restriction, and when the levy is imposed on the domestic transaction partners of the shipping companies, they impose the same incidence on the overseas shipping companies, just as if these shipping companies had been directly charged. States have jurisdiction over domestic entities and the levy incidence that follows from making the consignee/consignor the liable entity has only an extraterritorial effect, which legally cannot qualify as an act of sovereignty under the UNCLOS and would therefore be in line with the provisions of this Convention. The acting state is then able to impose the same levy incidence, through the detour of private contract law instead of directly through international public law. Thus, unlike in previous proposals, all emissions in the transportation of cargo to and from the acting state can be covered, not just the emissions of the last ship that brings the cargo into the acting state’s port. The ability to take unilateral action reduces the need for international agreement on a global fuel levy and, paradoxically, thereby increases its feasibility. The extreme flexibility of ships regarding their refueling location results in an absolute need for global implementation. In the context of international negotiations on this topic, a global fuel levy can be seen as a cooperative outcome that requires absolute unanimity. With this unanimity comes disproportionate bargaining power, as any one country, no matter its (economic) size, can prevent the cooperative outcome. Countries which ultimately cause the currently prevailing gridlock may have different motives for exercising this veto power. Firstly, oil producers may fear reduced revenues as demand for bunker fuels declines. Secondly, countries may try to obtain compensation for cooperating. These countries know that the last veto to be given up is of great marginal value to 'green' countries, which they aim to exploit. By reducing avoidance opportunities, the proposed levy creates an option that is effective also when not implemented globally, but by a subgroup of countries. Such a coalition will be able to establish the internalization of a share of total maritime emissions. This causes a shift from disproportionate veto power to bargaining power that is proportionate to the volume of final goods consumption one represents. Accordingly, the unilateral cargo-based levy will reduce oil producers' revenue streams. While the cooperative outcome would remain equally unattractive to oil producers, the non-cooperative outcome, or threat point, would become less attractive. The unilateral option will also reduce the difference between global agreement and the non-cooperative outcome for 'green' countries. It is exactly this difference that strategic blockers try to exploit. The extent to which the threat point value approaches the cooperative value for oil producers and for ‘green’ actors, and therefore the extent to which the chances of a global agreement improve, depends on how many countries are willing to take unilateral action. The mechanism can be integrated into ETS systems; in which case the cargo-based levy and the fuel levy both use the spot price at the time of the transaction (like an ETS with full auctioning). Using the ETS has the political advantage of reducing the number of parties needed to agree in the EU. Ideally, however, the levy is fixed as a stable price signal. This rate would be the Social Cost of Carbon plus the external cost of fine particulates, NOx and sulfur as explained further in our attachment. The proposal would have to be decided upon by the national parliaments of the coalition countries. In the case of the EU, supranational legislation would have to be passed, too. The actor in the government architecture would be customs departments. Firstly, this is because out of all units of Finance Ministries, customs departments are the most integrated across countries and used to sharing data, which would be needed for our mechanism. Secondly, customs agencies already engage the relevant entities in transactions to which the levy/subsidy from our mechanism could just be added. This is important because adding just one formality to an already existing data and financial transaction system creates less administration and compliance costs than the establishment of a whole new bureaucracy and the resulting transactions. Thirdly, custom departments are by far the best-staffed units of Finance Ministries, even though the importance of trade tariffs as a source of government revenue is dwindling with trade liberalization, making it increasingly difficult for these bureaucracies to justify their size. By giving custom departments responsibility for managing an emissions levy, unused capacity would be deployed, and furthermore the departments would receive a future-oriented justification for their existence, which will help politically to assemble support from the bureaucracy itself. Actions that we as a project team undertook was to gather feedback from stakeholders (at World Bank, IMF, European Commission, G20, the Dutch and German Finance and Environment Ministries, the European Confederation for Transport and Environment, Green Budget Europe, a large shipping company, and at workshops at the Universities of Berkeley, Copenhagen, Hamburg, Milan, Prague and Rotterdam). We have used this feedback to (continuously) improve the mechanism until hopefully launching this integrated version at the Solve Conference. Ideally, emissions from international shipping would be tackled through an international agreement, either under the auspices of the climate regime or, more likely, the IMO. However, negotiations are currently in a deadlock. Here, we have sketched a mechanism that allows for a unilateral solution to incentivizing GHG emissions reductions. In theory, the mere option for a unilateral mechanism will remove this hold-up from the climate negotiations, making a levy at the international level politically feasible. However, if the international levy is not feasible, our unilateral mechanism would enable a small coalition of countries to act. In terms of the countries acting, we have focused our analysis in the accompanying paper on EU member states, but the same mechanism could equally be used in other countries, most easily in Japan (for an island there are no concerns about modal switches), but also in the United States and Canada, as there are limited opportunities for avoiding the levy. The reduction in emissions depends on whether the availability of a unilateral levy is able to break the current hold-ups in negotiations for an international tax on maritime emissions. If a global levy on maritime emissions becomes possible, IMF and World Bank (2011) predict a minimum reduction of emissions by 5% (~55 mn tons of CO2) against the business-as-usual estimate until 2020, based on a levy of 25 USD per ton of CO2. Since we expect minimal carbon leakage, emissions should fall by a similar proportion under the proposed unilateral mechanism. The 5% estimate provides the minimum amount of emission reductions because our elasticity estimate ignores technical progress. Sims et al. (2014) and the European Commission (2013) estimate a technical reduction potential of 60-75% by 2050, but the current trend is the reverse. The uptake of efficient technology and practice (e.g. slow-steaming) would be incentivized by the emissions levy, driving a second round of emissions cuts. The unilateral mechanism would unsettle the current gridlock in international climate negotiations. Revenues can be distributed according to EU, WTO and UNFCCC rules, providing widespread incentives for the different political players that need to agree. Part of the revenue would be handed to the Green Climate Fund, which may yield a double dividend if used productively. Under the scheme international sea shipping would cease to be the last transport sector without emissions pricing. The design of the mechanism, featuring the coverage of emissions released by both international and internal shipping combined with the environmental purpose of the measure, makes it compatible with WTO law. By making the consignee/consignor the liable entity, the scheme overcomes potential challenges for the infringement of the right of innocent passage, i.e., the right established in the UNCLOS of a foreign vessel to navigate through the territorial sea of another state without being charged for doing so. Any measure to internalize maritime transport emissions will reduce the competitiveness of shipping companies, entail costs for the wider economy and influence trade patterns. Cost estimates vary both with the coalition applying the measure and the size of the levy. Costs for container shipping, which accounts for ~60% of total international shipping, are predicted to rise on average by ~10% if a global emission levy of as much as $90/tCO2 is introduced (Lee et al. 2013). The economic costs associated with the introduction of an EU levy on emissions from international container shipping have been estimated to be rather small (see figure below). Fiscal revenues from the levy have not been taken into account in this cost estimate. 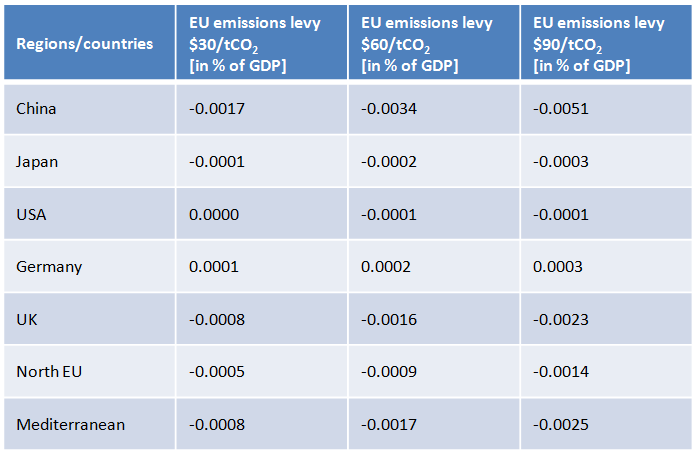 Estimates of economic costs of an EU emission levy on container shipping for various countries/regions in % of GDP. Authors' compilation according to Lee et al. (2013), p.98. Moreover, our mechanism strongly reduces distortions compared to previous proposals for unilateral action. As the levy is applied on the whole journey of all ships from the cargo’s port of origin to its destination, distortion of trade and avoidance behavior are minimized, as well as associated losses of revenue, the externalization of costs, carbon leakage and losses of productive efficiency. Administration and compliance costs are kept to a minimum in this scheme, unlike in alternative proposals for unilateral action, since existing transactions and data transmission channels are re-used instead of establishing new systems. Only a few new systems would need to be established, both for businesses and governments. Exact cost estimates depend largely on the acting countries' price levels and administrative structures. Overall, governments introducing the scheme would generate net revenues since avoidance opportunities are low and the demand for international trade is not expected to decrease considerably with an increase in transport costs due to the proposed emission levy. The mechanism could be applied immediately after the necessary legislation is passed. If the mechanism was introduced immediately, introduction would result in the default values for calculating the levy being less precise, i.e., the administration and compliance costs would be higher at first. Within the period up to 2020, however, the mechanism would be fully functional because the needed data systems such as Measurement, Reporting and Verification (MRV) (for the EU), EU eManifest, Energy Efficiency Design Index (EEDI), Ship Energy Efficiency Management Plan (SEEMP), Automatic Identification System (AIS) and Long-range Identification and Tracking (LRIT) will all be running by then, and enable a detailed calculation of the default values (see accompanying paper for details). Over the medium term, the option to pursue a functional unilateral mechanism for the internalization of maritime emissions should remove the current blockades of international negotiations, such that an international levy on maritime emissions becomes incentive-compatible. Our mechanism is the sibling of the forestry proposal “Supplementing forest sustainability certificates with fiscal instruments”. In both proposals we sketch solutions for fiscal climate policy in two challenging sectors that are experiencing similar difficulties with extraterritoriality, limited information availability and carbon leakage. Due to these difficulties, unanimous international support is needed for a systematic fiscal policy. The lack of it, however, has led to the proliferation of small, largely ineffective showcase forestry policies and a few regulatory standards in the maritime shipping sector. For both cases we describe how to solve these issues by making producers and consumers pay for the climate damage they cause. Our proposals do not require international unanimity, and avoid data problems, tax competition and extraterritoriality issues. Both mechanisms are based on re-using existing customs systems to save on administration costs and compliance costs. Bäuerle, Tim, Graichen, Jakob, Meyer, Kristin, & Seum, Stefan. 2010. Integration of Marine Transport into the European Emissions Trading System. Federal Environment Agency (Germany), Dessau. European Commission. 2013. Considerations for the Implementation of the eManifest. European Commission, DG Taxation and Customs Union, Brussels. Faber, Jasper, Boon, Bart, Berk, Marcel, Den Elzen, Michel, Olivier, Jos, & Lee, David. 2007. Aviation and maritime transport in a post 2012 climate policy regime. Netherlands Environmental Assessment Agency, Bilthoven. Faber, Jasper, Markowska, Agnieszka, Nelissen, Dagmar, Davidson, Marc, Eyring, Veronika, Cionni, Irene, Selstad, Espen, Kågeson, Per, Lee, David, Buhaug, Øyvind, Lindtsad, Haakon, Roche, Philip, Humpries, Emma, Rose, Norton, Graichen, Jakob, Cames, Martin, & Schwarz,Winfried. 2009. Delft Report. CE Delft, Delft. Federal Office for Goods Transport (Germany). 2005. Marktbeobachtung Güterverkehr - Sonderbericht zum Seehafen-Hinterlandverkehr. Cologne. Hemmings, Bill. 2011. The CO2 Taxation Option for an EU Shipping Measure. IMF & World Bank. 2011. Market-Based Instruments for International Aviation and Shipping as a Source of Climate Finance. International Monetary Fund, World Bank, Washington, D.C.
IMO. 2014. Third IMO GHG Study 2014. International Maritime Organization, London. Kågeson, Per. 2009. Environmental Impacts of International Transport Making International Transport Pay Its Climate Bill. Kågeson, Per. 2011. Options for Europe when acting alone on CO 2 emissions from shipping Introduction Range of participation. Keen, Michael, & Strand, Jon. 2006. Indirect Taxes on International Aviation. IMF Working Paper Series. Keen, Michael, Parry, Ian, & Strand, Jon. 2013. Planes, ships and taxes: Charging for International Aviation and Maritime Emissions. Economic Policy, 28(76), 701–749. Kollamthodi, Sujith, et al. 2013. Support for the impact assessment of a proposal to address maritime transport greenhouse gas emissions. Ricardo-AEA, Oxford. Lee, Tsung-Chen, Chang, Young-Tae & Lee, Paul. 2013. Economy-wide impact analysis of a carbon tax on international container shipping. Transportation Research Part A: Policy and Practice, 58, 87–102. Sims et al. 2014. Transport. Chap. 8 of: Climate Change 2014: Mitigation of Climate Change. Working Group III Contribution to the IPCC 5th Assessment Report. Geneva: Intergovernmental Panel on Climate Change. Please also see our accompanying paper with details on the mechanism’s relation to the scientific literature at http://ssrn.com/abstract=2512747. Please furthermore find a presentation of the mechanism at http://bit.ly/1DfoyX3.